Combining quality, innovative technology and affordability, Brother fax machines are designed to meet your budget as well as your home, home office and business requirements. 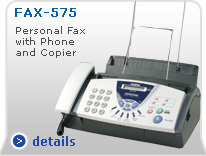 Buy direct from BrotherMall and choose from a large selection of genuine Brother fax machines for sale including inkjet, laser, laser/LED all-in-ones, inkjet all-in-ones, ribbon transfer fax machines and portable scanners. Discover the exceptional quality and value that are synonymous with Brother. From business-class Brother laser fax machines to compact inkjet fax machines for the home, when you choose Brother you can be sure you are receiving a reliable, high-speed machine backed by exceptional technical and customer support. Shop the categories above for genuine Brother fax machines and see why BrotherMall is the easiest, most convenient way to purchase all your high performance home and office products, printer supplies and accessories. You can shop with confidence since we are the official manufacturer’s website, plus enjoy FREE shipping on orders over $49.99!